Goldman: "This Is the Largest And Fastest Correlation Change On Record Outside Of 1987"
Back on January 20, the day of Trump's inauguration, Morgan Stanley pointed out a striking change to the cross-asset regime, noting that "We Haven't Seen A Shift This Severe In Over A Decade", after cross-asset correlations had plunged the most on record. As we noted at the time, there were positive and negative consequences from this shift: from an economic perspective, the dramatic move was troubling because such a decline is common in 'late cycle' environments, as 'idiosyncratic' stories (company-specific M&A, tweets) become larger drivers than economic or earnings fears. The decline is directly linked to the lower realized volatility seen in credit and equity markets; when underlying components are moving in different directions, it is harder to get large shifts overall. In retrospect, the move also unleashed the record low-vol environment that characterized most of 2017... if not 2018. At the same time, lower correlations meant a better 'macro' trading environment (since each market isn't the 'same' trade), and has traditionally been said to usher in a "stock-picker's market" (as opposed to a central bank-frontrunning market), although what it mostly ushered in was complaints by banks and hedge funds that "vol was too low." That said, it is a mixed blessing for diversification, as it lowers overall portfolio volatility, but also makes hedging through 'proxies' harder. Whatever the consequences of record low correlation may have been, however, they are now over because in a note released overnight, Goldman's chief equity strategist David Kostin, shows that in a furious reversal of the January 2017 move, over the past 3 months, stock correlations within the S&P 500 have surged to the 95th percentile since 1980. 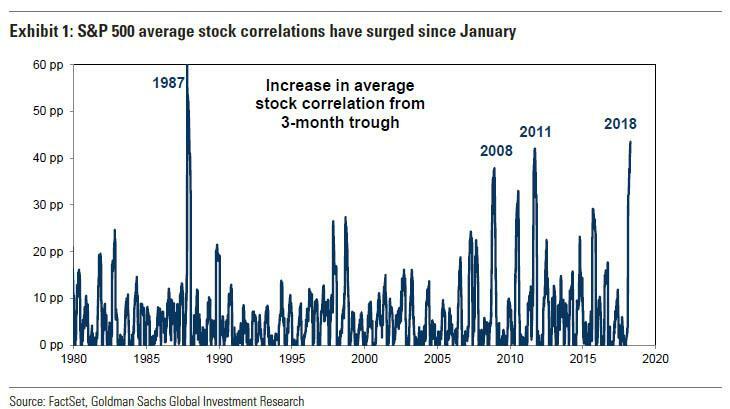 Specifically, average 3-month S&P 500 stock correlations have increased from just 9% in January to 52% today, a move which Goldman calculates was "the fastest and largest increase outside of 1987." Average stock correlations declined to an all-time low of 9% driven in part by the creation of winners and losers from tax reform. However, stocks have become more correlated during the risk-off events since January. As our Options Research team highlighted, investors increasingly migrated to ETFs and other index products, offering little stock-level differentiation of the potential impacts from trade and regulation. Furthermore, the S&P 500 drawdowns YTD have come through broad valuation compression rather than earnings weakness, as economic activity has remained healthy. One more notable thing: despite the two 10% corrections YTD, Goldman cautions that the pickup in equity volatility has been modest when compared with the rise in correlations. This dynamic has resulted in a decline in S&P 500 return dispersion and has made the environment difficult for stock-pickers, meaning that just like before, hedge funds will be complaining they can't make money due to too much volatility, not to be confused with 2017, when they couldn't generate alpha due to not enough vol. The 24% increase in average implied stock volatility is smaller than typically associated with a jump in correlations of this magnitude. History would suggest that the 43 pp increase in average stock correlations would have corresponded with a 36% increase in volatility. Previous stress periods such as 2008 and 2011, though more fundamental in nature, saw substantially larger increases in volatility. So what happens next? Here Kostin's underlying argument is that he "does not forecast a bear market or a recession this year" as a result "volatility is unlikely to rise by a sufficiently large amount for return dispersion to move meaningfully above the long-term average." It also means that Goldman expects "correlations will fall and push return dispersion higher in 2018." On the other hand, it also means that if correlations continue to rise as they have been, especially in the past 2 weeks when the entire market rises or falls by several hundred Dow points every day, Goldman will be wrong (again), and not only will stock picking get even more difficult, but the VIX is set to spike to new post-crisis highs, this time finally dragging the vols of all other asset classes with it.